A ballistic galvanometer is similar in principle to the permanent moving coil instrument. It has a moving coil suspended between the poles of a permanent magnet. The coil is wound on a nonmetallic former so that there is very little damping. The first deflection or 'throw' is proportional to the charge passed through the galvanometer if the duration of the charge passed is short compared with the time of one oscillation. Fig. (a) shows the circuit arrangement for the determination of B-H curve of a magnetic material by ballistic galvanometer. The specimen ring of uniform cross-section is wound uniformly with a coil P, thereby eliminating magnetic leakage. The primary coil P is connected to a battery through a reversing switch RS, an ammeter A and a variable resistor R1. 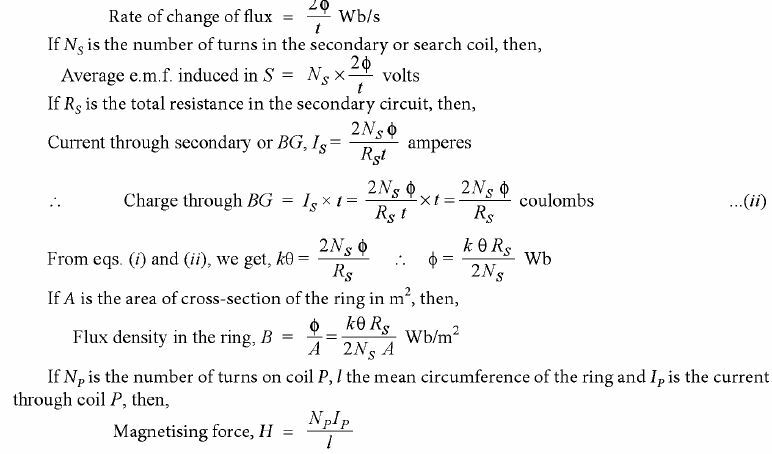 Another secondary coil S (called search coil) is wound over a small portion of the ring and is connected through a resistance R to the ballistic galvanometer BG. Theory. We shall use subscript P for primary and subscript S for secondary. The above experiment is repeated with different values of primary current and from the data obtained, the B-H curve can be plotted.